By the middle of the 19th century the enthusiasm for lithography witnessed during the 1820s had all but faded. The medium was seen as tainted by its association with commercial printing and reproductive illustration, and held little appeal for artists interested in producing innovative work with the mark of individuality. The province of original printmaking had shifted to etching, and it is in the marvellous work of Charles Meryon that we find the source of that far-reaching movement known as the etching revival, which carried the medium into the 20th century. Meryon’s etchings were shown at the various Salon exhibitions in Paris between 1850 and 1867, yet the merits of his work went unrecognised by the juries (who favoured traditional engraving) and he had difficulty marketing his prints. His standards were exacting and he took extraordinary care printing trial proofs from his own wooden press. Nevertheless, his work was greatly admired by such eminent critics as Philippe Burty and Charles Baudelaire, and by Victor Hugo himself. 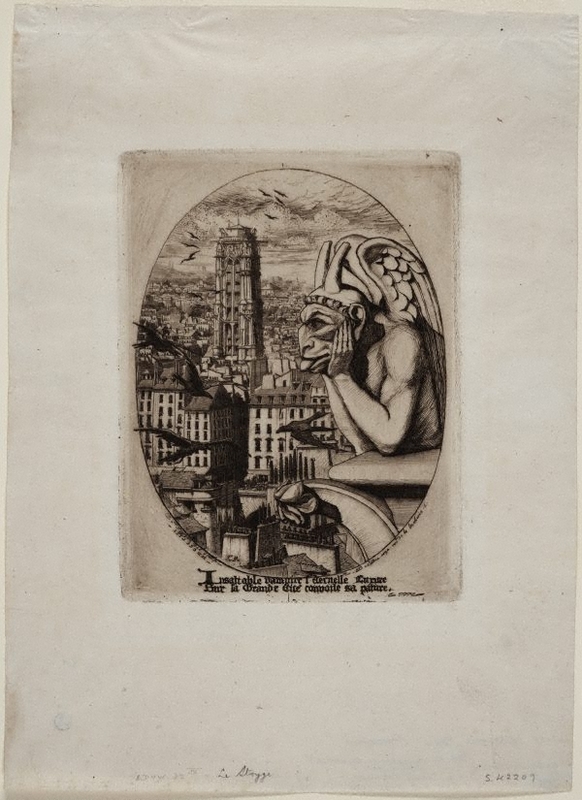 Subsequently, scholars of the history of graphic art allow him a central position after Rembrandt and Goya, his reputation secured for posterity thanks to his celebrated series of 22 etched views of Paris, Eaux-fortes sur Paris, made between 1850 and 1854. Meryon began his career in the navy. Serving as midshipman on the corvette Le Rhin he departed in 1842 on a four-year voyage that took him to the South Pacific, including New Zealand and Australia. Back in Paris in 1847 he studied to become a painter but was led into etching by the discovery that he was colour blind. He received training in the technique from the landscape etcher Eugène Bléry. Meryon’s etchings are remarkable for the accuracy and detailed clarity with which he depicted the architectural fabric of Paris. His deep affection for the quaint old streets and cramped buildings – whose destruction during Baron Haussmann’s renovation of Paris was imminent – is almost palpable in the heightened sense of past and present that his views convey. 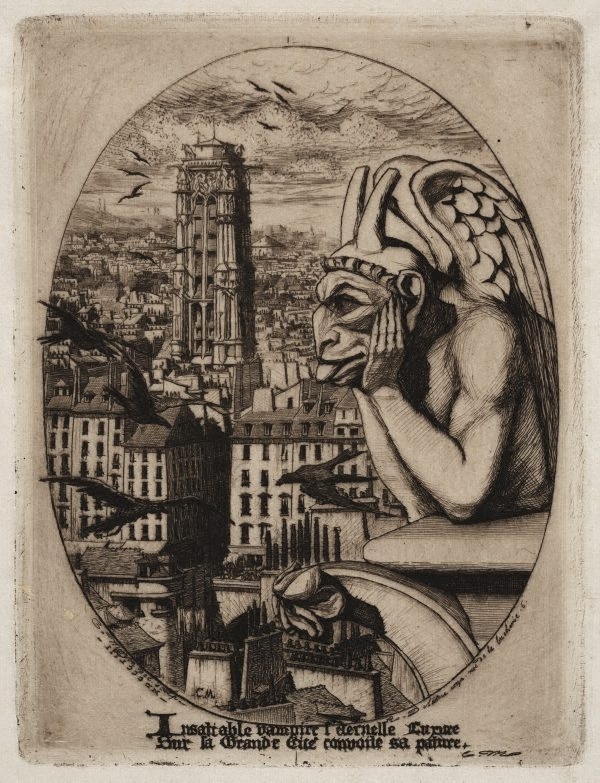 Owing a clear debt to the innovations of photography, and a greater one to the inspiration of Hugo’s evocation of the medieval city in Notre-Dame de Paris (1831), in which the writer describes a bird’s-eye view of Paris from the cathedral towers, Meryon’s most famous print, The vampire, affords an aerial view of that city as if seen through a telescopic lens. The composition is dominated by a stone gargoyle projecting from a tower of Notre Dame Cathedral; in the middle distance the prominent Tour Saint-Jacques rises over the houses. Crows circle in the air – the wings of the two closest intersect the oval border with the effect of making the gargoyle appear even closer. The image has a powerful aura of strangeness and unreality. This monster which I have represented does exist, and is in no way a figment of imagination. I thought I saw in this figure the personification of Luxuria [the sin of lust]; it is this thought which inspired me to compose the two verses at the bottom of the print, in which I neglected to count the syllables, ignorant as I was at that time of the rules of versification. Signed and dated l.l., [incised plate, date printed in reverse] "C.Meryon ... / IIILCCDM". Signed l.l. and l.r., [incised plate] "C.M.". The catalogue raisonné of the prints of Charles Meryon , London, 1990, p 56, illus p 57, illus p 58, illus p 59, illus p 60. cat no 20 Illustration on p 34 is the first state; illustration on p 35 is the fourth state; illustration on p 36 is the sixth state; illustration on p 37 is the seventh state. Prints & drawings Europe 1500-1900 , Sydney, 2014, p 132, col illus p 133.